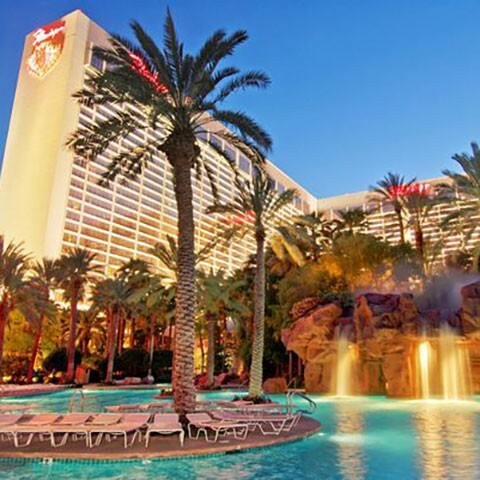 Located in the heart of the Las Vegas Strip, the Flamingo Las Vegas is a true desert oasis. The center Strip resort features more than 3, 500 guest rooms, including the newly renovated and award-winning, Flamingo GO Rooms. The historic hotel-casino is home to a sprawling 15-acre pool and wildlife habitat complete with waterfalls, mature island vegetation, tropical wildlife and three distinctive pools. Flamingo Las Vegas hosts a wide variety of entertainment and dining options. There is something for every palette with eateries such as Jimmy Buffet’s Margaritaville, Center Cut Steakhouse and Carlos’n Charlie’s. An all-star line-up of entertainers keeps things lively at the fabulous Flamingo. Get ready for some summer lovin’ and have a blast as Olivia Newton-John makes her way to Flamingo Las Vegas with her resident show, “Summer Nights.” Brother-sister duo Donny & Marie dazzle audiences as the resort’s headliners, comedians George Wallace and Vinnie Favorito keep audiences laughing seven nights a week and comedy-magician Nathan Burton entertains afternoon audiences. Guests will feel Forever Fabulous in Flamingo’s newly remodeled FAB rooms. Stylish décor meets simple luxury with splashes of signature Flamingo pink and wood-toned floors and furnishings throughout the 350-square-foot space. Contemporary chaise lounges, patterned rugs, chic lighting and vintage Vegas framed artwork create an ultra-modern setting. Dive into paradise at the Flamingo, where you’ll enjoy table games, slot machines and a whole lot more. Welcome to Payout Paradise – a Las Vegas gambling area with more than 1,600 casino slot games, including video poker and Megabucks. With so many choices, you’ll always experience a great time at this Las Vegas casino. You can play Vegas casino games like craps, blackjack, baccarat and roulette. For a more relaxing experience, The Flamingo offers a keno lounge next to the race and sports book. Extend your gaming experience at Jimmy Buffet’s Margaritaville, featuring a 15,000-square-foot casino. Enjoy the Vegas casino’s laid-back island vibe and choose from 22 gaming tables and 220 slot machines.